Summertime means outdoor living by creating comfortable outdoor living spaces, whether it’s through a permanent remodel or a seasonal sun shade. If you have an outdoor living space that’s underused or just an urge to spend more time relaxing outside, you can make the most of your home’s exterior on long summer days by creating outdoor rooms. 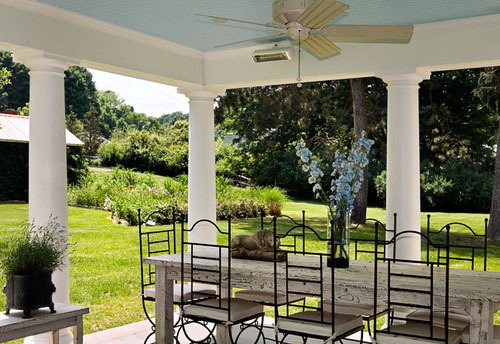 This Case Design outdoor dining room creates a shady oasis with a country view. An open, covered area without the cost of windows, heating, or infrastructure for power or water can be an affordable, yet luxury, home improvement. Image courtesy of Logan’s Hammer Building and Renovation. This state-of-the-art Seattle-area sun porch has all the amenities of an indoor room: a grill with ventilation, running water, refrigeration, fireplace, flatscreen, ceiling fans, and even space heaters. An outdoor room living room, kitchen, dining area, or even a bedroom can be created out of any number of exterior spaces. An indoor outdoor room combines shade and shelter with fresh air and views, while some outdoor living spaces have no roof or shelter at all. The secret is in defining the space and decorating it with the right water resistant materials. Waterproof cushions, pillows, and area rugs give this open deck an interior feel. 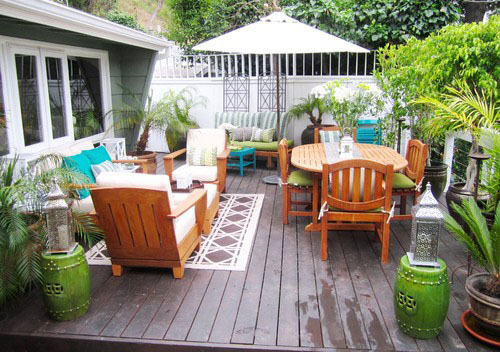 An outdoor room can be fashioned out of any space that’s adjacent to your home. 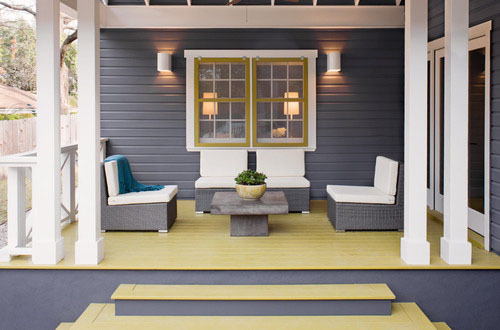 Porches, decks, balconies, patios, and even open spaces can all become outdoor living rooms with a few easy design techniques. 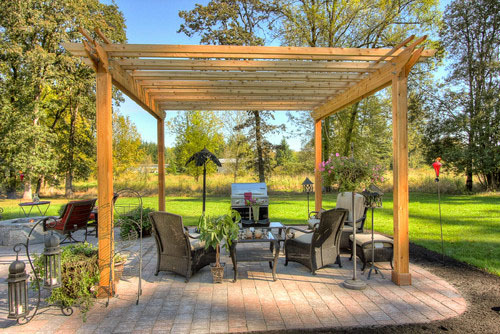 A pergola is one common way to provide the framing for an outdoor structure. 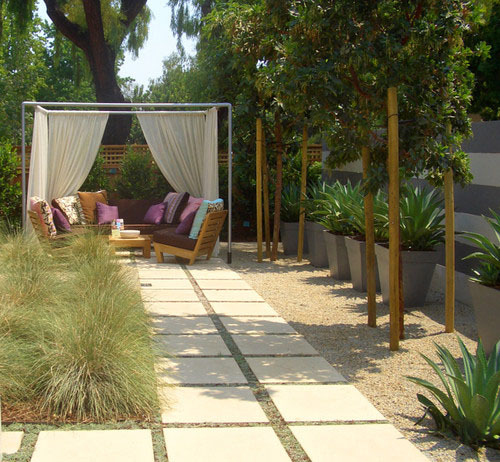 A traditional pergola creates shade by providing a place for vining plants to grow, as in this Mediterranean-inspired patio by Sandy Koepke, but in many outdoor rooms it becomes another space-defining design element. Image courtesy of Paradise Restored Landscaping and Exterior Design. This Portland pergola lets the sun shine through any time of year. 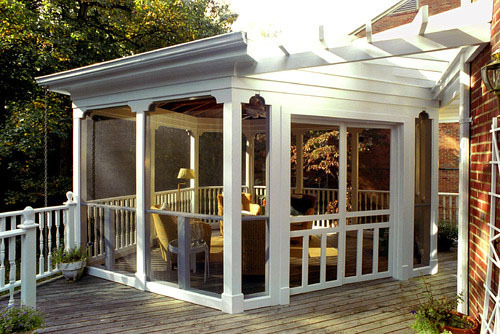 A covered porch or a patio with a pergola are easy to add-on to most homes if you’re interested in doing a permanent addition to help create an outdoor living space. 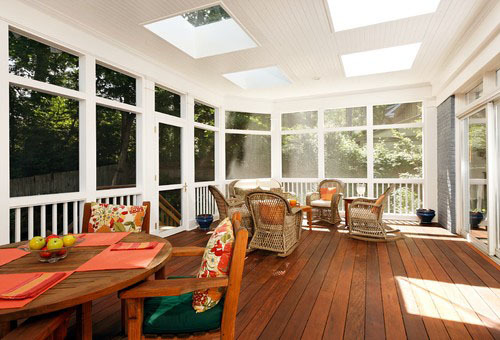 This Case Design/Remodeling sun porch put a screened outdoor room in the unused corner of the home’s existing deck. With a permanent shelter to protect furniture and keep the sun and bugs at bay, the family now spends more time outdoors than in. Adding on to your home can be cheap and easy when it comes to impermanent structures. 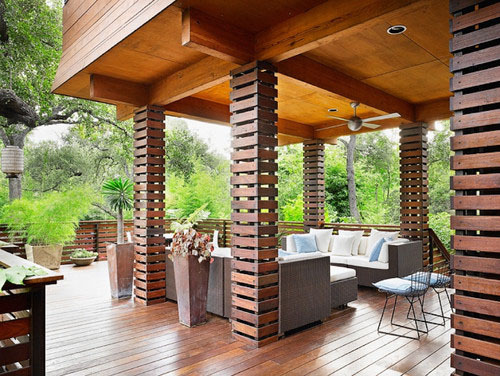 Walls and a ceiling of sorts help define the parameters of an outdoor living space, but these can be fashioned from nearly anything when it comes to outdoor rooms. Try experimenting with some different creative ideas inspired by some of these do-it-yourself outdoor room photos. Some people simply put an outdoor room where there’s space. PVC pipe and transparent drapes provide the walls for this backyard oasis by Shades of Green Landscape Architecture. Image courtesy of Becky Harris. Smaller patios, narrow driveways, and apartment balconies can be transformed into stylish outdoor spaces too. 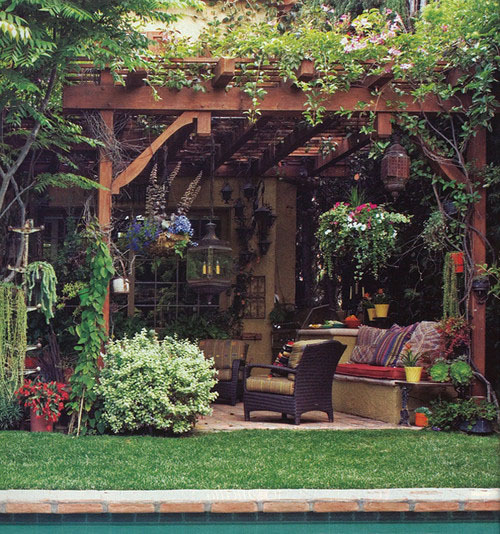 An outdoor room doesn’t have to have a lot of frills or square footage, just a peaceful setting to relax in. Image courtesy of Barbara Cannizzaro. A vacant deck corner becomes a private summer reading nook with the help of some bamboo shades, a comfy couch, and colorful accents. 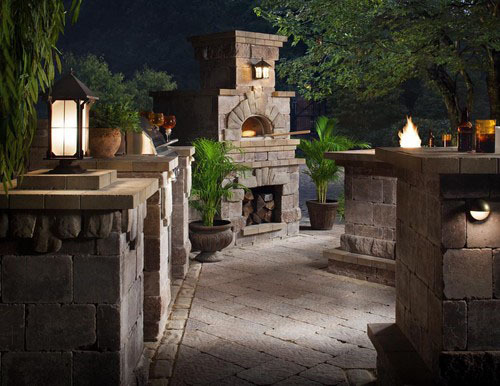 An outdoor living space must be comfortable and inviting. Creating an outdoor space with interior design elements is essential to both the function and appeal of a modern outdoor room. In many cases, it’s simply a matter of finding items made from materials that weather well. Image courtesy of Texas Construction. There’s no room for rockers on this front porch. Comfy, living room-style furniture is gracing all types of outdoor rooms these days. Patio furniture is taken to the next level with exterior easy chairs and coffee tables. 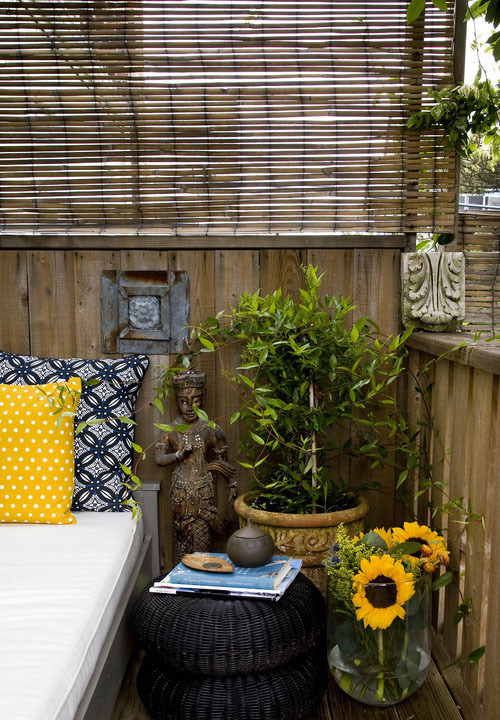 Wrought-iron trellises, waterproof cushions and pillow covers, and a coffee table refinished in exterior paint are all well-protected from the elements and easy to keep clean. Image courtesy of Webber Studio Architects. Integrating elements that add comfort—such as shade, cushy couches, running water, or a ceiling fan—help make outdoor rooms a place where people want to spend their time. In many areas of the country it’s too hot during the day to spend time outside, but the evenings can provide some much-needed relief and protection from bugs inside a screened room or porch. Many indoor outdoor rooms aren’t much more than an open extension of the home, and some are more open than others. Skylights provide filtered sunlight and the open framing keeps views clear on this screened sun porch by Case Design/Remodeling of Bethesda. Image courtesy of Joel Snayd. Screened porches, long-time staples in the East and South, are now providing much-needed fresh air and protection from bugs in many homes across the country. 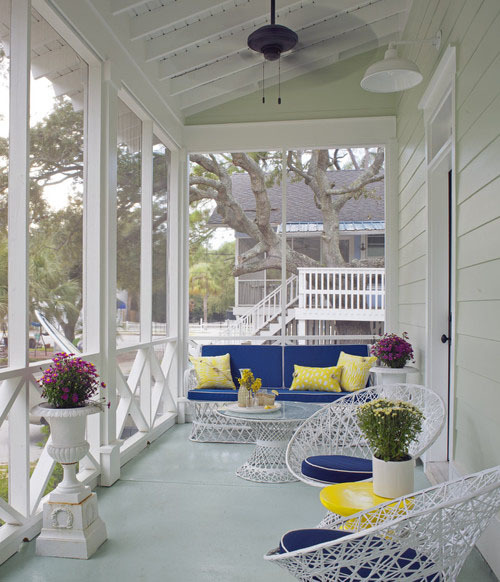 This screened sun porch retains an open feeling with plenty of views and light colors. 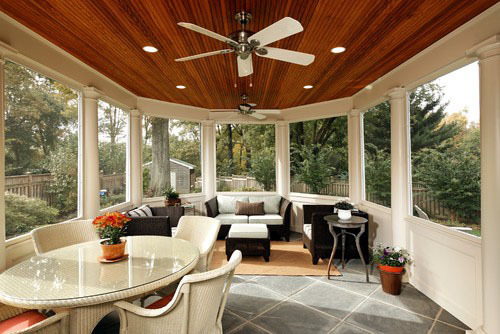 A screened sunroom by Case Design creates an interior feeling with views on three sides and plenty of fresh air. 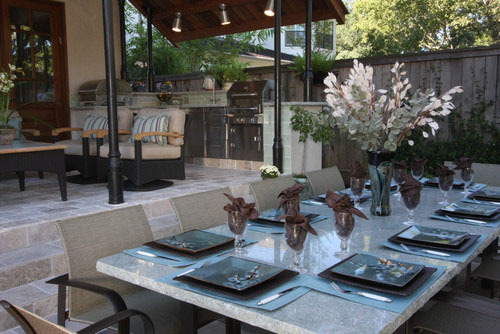 Many outdoor rooms are centered around eating and entertaining. 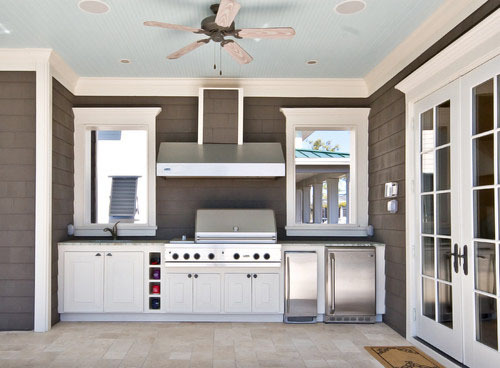 Adding a kitchen to your outdoor living space makes cooking and serving food outside a lot easier. It also means you’ll spend even more time outside during the warmer months. Image courtesy of Sandy Koepke. 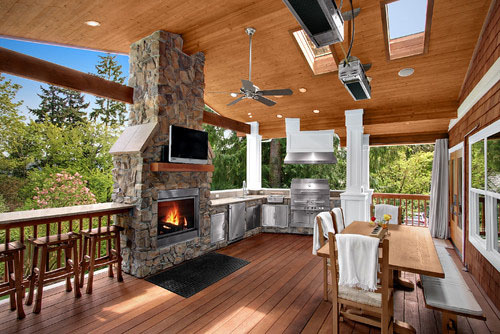 A gourmet outdoor kitchen puts a whole new spin on summertime barbecues. Image courtesy of Chipper Hatter Architectural Photography. A wood fired pizza oven is a nice addition to this exterior natural stone kitchen. Image courtesy of Lorraine Vale. 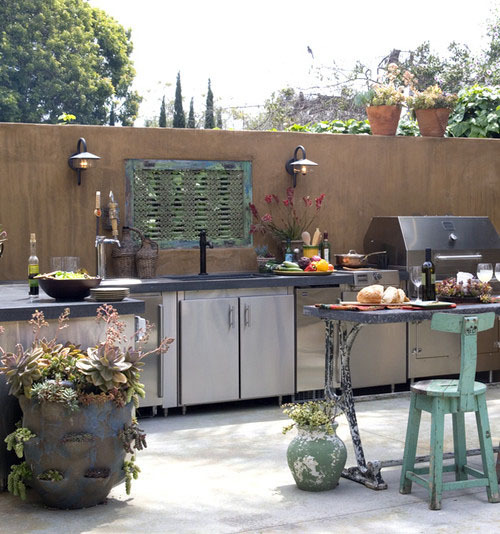 This outdoor patio kitchen is tucked out of the way in a nook but makes outdoor serving and entertaining so much easier, and a lot more fun for the cook too. 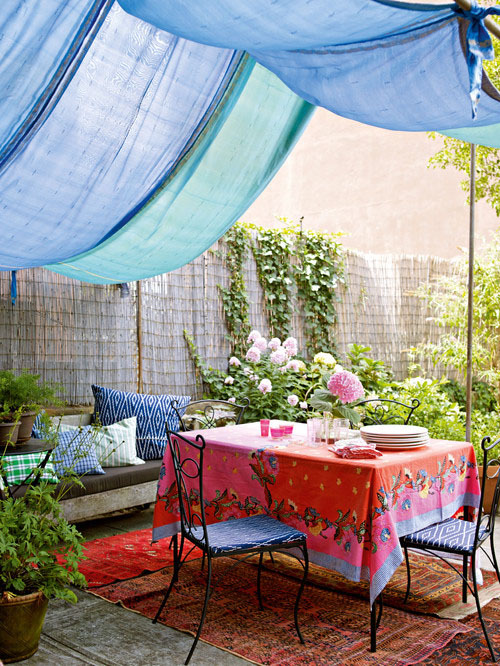 With an outdoor setup like this one by Dena Brody, there’s no reason to spend time indoors when it’s warm out. Many climates experience cooler temperatures on summer nights. Even if fire is the last thing you want at the end of a muggy summer day, adding an outdoor fireplace can extend your time spent outdoors into the fall and spring months. In more temperate areas, it can even mean year-round outdoor living. An adobe fireplace creates a warm atmosphere any time of year. Image courtesy of Forum Phi. 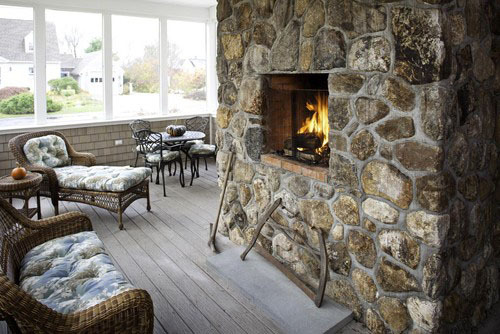 Adding a fireplace to any indoor outdoor living area makes it more useful year-round. 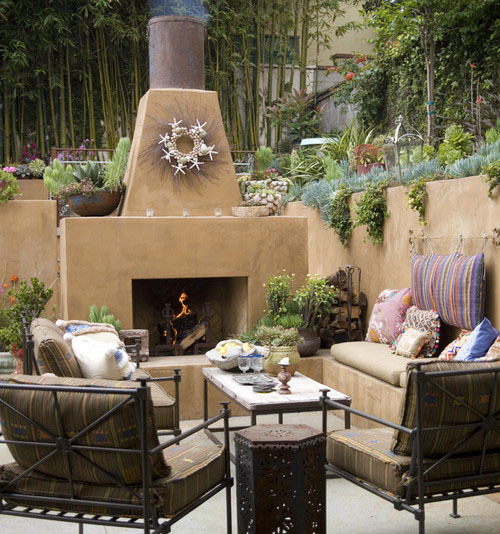 How have you made your own exterior spaces into outdoor living rooms? Share your exterior room design ideas and creativity with our readers below.